Maggi noodles can be used as a base for quick and easy meal, with separate beef flavour sachet to add depending on desired taste. 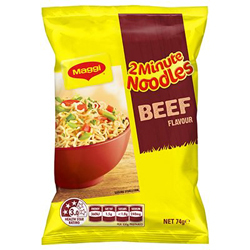 Maggi noodles can be cooked in just 2 minutes, contain no artificial colours and are 99% fat free. Noodle Cake: Wheat Flour, Palm Oil (Antioxidant E319), Salt, Mineral Salts (E508, E451, E501, E500), Vegetable Gum (E412). Flavour Mix Sachet: Iodised Salt, Flavour Enhancers (E621, E635), Mineral Salt (E508), Sugar, Yeast Extract, Soy Sauce Powder (contains Wheat and Soy), Colour (Caramel III), Flavours, Palm Fat (Antioxidant (E320)), Onion Powder, White Pepper Powder, Food Acid (Citric), Rosemary Powder.